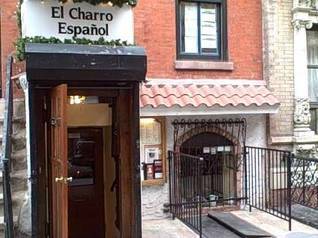 It's the quintessential New York experience: enjoying Basque-style tapas, prepared by a Hawaiian chef, in a TRONesque setting, on the terrace of a swank hotel (with a doorman standing watch at the velveteen-roped entryway), while viewing videos on a 35-foot outdoor high-definition LED screen. That's the vibe at Bar Basque, a trendy, upscale spot for superb food and drink near Herald Square in Midtown Manhattan. My Comestaccomplice and I had the pleasure of sampling Executive Chef Yuhi Fujinaga's summer menu recently as guests of Bar Basque. Opened 14 October 2010 on the second floor of Eventi (a Kimpton Hotel), Bar Basque features an extensive terrace lounge dining area with expansive windows. Entering the space, however, is like stepping into a science fiction film. The incarnadine walls and dim lighting are the work of Syd Mead, an acclaimed film and conceptual designer. His influences in films like Blade Runner, Aliens, and TRON are morphed into the restaurant's high-tech design. Some passageways—such as the ones to the rest rooms—are so dark as to require navigational assistance from members of the helpful staff. (Collisions are not uncommon.) The lounge and outdoor dining terrace (achieved with the aid of retractable windows), however, afford ample light by which to dine, imbibe, and schmooze. To whet our appetites and accompany our first courses, we selected a light, slightly effervescent Basque wine. The refreshing frizzante crackle of the Ameztoi Txakoli Getariako 2009 ($42) invites comparison with its less complex trans-Iberian cousin Vinho Verde. With light food, or by itself, it's a delightful summer wine. 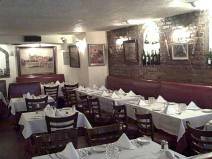 Offering over 40 tapas selections, the menu also contains a variety of grilled fresh fish, shellfish, and meat items. Our tasting menu consisted of four courses—each with its own wow factor—reflecting Chef Fujinaga's interpretation of a casual alfresco dining experience of seasonal specialities from Spain's Basque region. Our first course comprised Idiazabal Cheese Croquettes (croquetas de queso Idiazabal) and Yellowfin Tuna Tartare "Push Pops" with Red Wine Caviar (tartare de atun en "push pop" con caviar de vino tinto). The croquettes ($8) were beautiful creations that succeeded both in texture and in flavor. Their smooth, creamy interior provided a sublime contrast to the exquisite crispness of the crust. The cream-to-crunch sensation, together with the mild, subtle piquancy of the sheep's milk cheese, conspired to produce an incredibly delicious starter. And with its bright, sparkling flavors, the wine was a perfect match. The "push pops" of yellowfin tuna, tomato, red wine caviar, anchovies, and pepper ($9) were a visually appealing and fun treat that tasted heavenly! The combination of flavors and textures was as refreshingly playful as it was tasty. We mused over whether the additional saltiness of plain caviar would have yielded a better balance of flavors against the sweetness of the tuna. The jury is still out, but then, why should we try to fix something that isn't broken? Our second course consisted of Yellowfin Tuna Crudo, Ajo Blanco, Chimichurri (atun con ajo blanco y tximitxurri); Sea Scallop Crudo, Black Olives, Preserved Lemon (vieiras con aceitunas negras y limon en conserva); Octopus, Black Olives, Tomato Confit, Extra Virgin Olive Oil (pulpo con aceitunas negras, confit the tomate, aceite de olive extra virgin); and Spanish Mackerel, Escabèche-Style, Shallots, Chiles, Coriander Seeds (jurel en escabeche de chalotas, chiles y semillas de coriandro). Yellowfin Tuna can never miss as long as it's fresh—and this was about as fresh as it gets. When raw tuna is this good, the concern is that any addition, especially something as bright and complex as chimichurri, will mask the delicacy of the fish. Such fears, however, would be unfounded with Chef Fujinaga's tuna crudo ($12). The white garlic sauce and chimichurri added liveliness to the tuna's sweetness, rather than masking it. This presentation could not have been more enjoyable. Based on the impeccable freshness of all the other seafood, the scallops ($12) were undoubtedly of similar stellar quality. While allergies prevented us from attesting personally to these mollusks, we can vouch for their garnish. The toasted, crumbled black olives were as tasty as they were creative. The smokiness added by toasting is a brilliant enhancement of the olive's intrinsically rich, earthy flavor, and a perfect foil to a lemon concentrate. This is something that would probably serve as a great garnish for swordfish or trout as well. The Octopus ($8) and the Spanish Mackerel ($8) shared an innovative presentation: a sardine can, replete with an attached key. The lid lifted off, however—no rolling back was necessary. Octopus wants to be the tofu of seafood; it's typically paired with a very interesting marinade or vinaigrette, with the idea that the bland meat will absorb the sauce, and the resulting whole will be greater than the sum of its parts. Alas, neither of us has ever met an octopus preparation that realized that ideal, and this one was no exception. No amount of marination seems to be able to penetrate this cephalopod's dense flesh. Although the black olives and the confit of cherry tomatoes did their best to keep this octopus from foundering, we were left, ultimately, with a taste of marinade, followed by a stint of bland, rubbery mastication. The "canned" Spanish Mackerel, on the other hand, was highly enjoyable. It was yet another superb dish that melted in our mouths. Not only did the accompanying shallots provide a pleasing contrast to the fish, they could also be used to enhance the flavor of the aforementioned octopus. 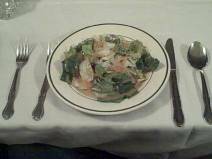 The third course came with more heft, and a wine to match. Our second bottle, again Basque, was a Gorka Izagirre Txakoli Bizkaiko 2009 ($45). While the card described it as having a medium body, we found this wine's body to be closer to full. Perhaps we should have stayed with the previous, lighter wine. Our penultimate course comprised Smoked Trout A La Plancha, Jamón Butter (trucha ahumada a la plancha, mantequilla de jamón); Slow-Braised Pork Belly, Baby Clams, Albariño Wine Sauce (tocino asado con almejas, salsa de viño albariño); and Heirloom Tomato Salad, Dandelion, Pedro Ximénez Sherry Vinegar, Mediterranean Sea Salt (ensalada de tomate de granja, vinagre pedro ximénez, sal del mediterraneo). The trout ($12), grilled to a luscious golden-brown, shared the plate with a well-matched caviar garnish. While I thoroughly enjoyed the smoky, spiciness of the fish along with its accompanying salmon roe, my Comestaccomplice found it good, but a bit salty. The divine Hampshire Pork Belly ($12) was one of the most ethereal dishes we'd enjoyed in a long time. Fat is not commonly welcome as a garnish, let alone as the main event. But the slice of meat comprised at least two-thirds fat, enveloping impossibly tender flesh. The flavoring was extremely subtle—perhaps little more than the wine and a touch of salt. How can something be so rich, yet so light and delicate at once? The baby clams were especially succulent thanks to the pork juices. Furthermore, their slight chewiness was a perfect foil to the adiposity of the pork belly. This outrageously satisfying dish was easily our favorite of the evening. The generously sized Heirloom Tomato Salad ($10) was garden-fresh and dressed appropriately. Its very simple preparation made it a perfect palate cleanser for all the complexity and richness that preceded it. The salad achieved a delicate balance of flavors among the sweet tomatoes, the lightly acidic vinaigrette, and the subtly bitter dandelion greens. Our marvelous meal came to a sweet close with the fourth course comprising Piña Colada, Coconut Flan, Pineapple Salad, Rum Caramel (piña colada); and Fried Milk, Passion Fruit Reduction, Chocolate Ganache (leche frita). Flan is a favorite dessert, and pineapple a favorite fruit. Thus, there was little chance for this dish to fail. Much of this meal showcased contrasting textures and flavors. In this case, the Piña Colada ($9) played the smoothness of the custard against crunchiness of the pineapple. The use of coconut afforded exceptional richness without the usual cloying sweetness. Chef Fujinaga exhibited European restraint, delivering a highly refreshing dessert in which the various sweet nuances cavorted on the palate harmoniously with the acidity of the pineapple. The Leche Frita ($9) was a sweet bookend to the savory cheese croquettes with which we began. Again, the texture was flawlessly smooth. Furthermore, the two sauces were lovely complements—both visually and gustatorily—to the fried milk, as well as being pleasant contrasts to each other: tangy fruit versus velvety, rich chocolate. It's highly unusual for any restaurant to thrill my palate so completely from start to finish. It goes without saying that my Comestaccomplice and I enjoyed basking in the seasonal gastronomic delights of Bar Basque, and look forward to exploring the menu further. The tapas dinner menu is served Sunday through Thursday from 4:00 P.M. till 10:00 P.M., and Friday and Saturday from 4:00 P.M. till 11:00 P.M. 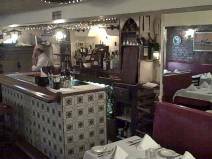 The dining room and bar haven’t changed much since my first visit to El Charro Español more than a decade ago. The décor in this West Village Spaniard looks as though it hasn't undergone significant modification over the last half-century or so—it's somewhat old-fashioned but comfortable nonetheless. 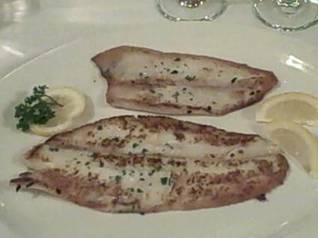 Be it tradition, reliable quality, or whatever the reason, I order the same dish invariably: Filet of Grey Sole A La Plancha. The preparation is simple, yet the results so delectable. 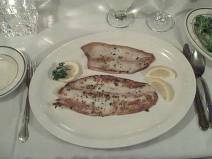 Ostensibly, a superior piece of grey sole is placed onto a grill and then removed at just the right moment. That's it. Though I've been told repeatedly that the sole is not seasoned, it does reveal slight hints of garlic and possibly salt. Perhaps I tasted the essence of the grill itself, seasoned over the years with the countless meals cooked upon it. Regardless, the resulting preparation is perfect. My first experience here taught me not only that nothing needs to be added, but that nothing should be added to this exquisite fish. To wit, I made the mistake of sprinkling a small amount of pepper onto my pescado—it changed the flavor enough to diminish it. I had unwittingly destroyed a masterpiece. 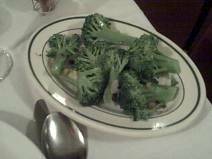 My salad and vegetable dish (broccoli with garlic) were rather good, but unremarkable. Though I did not order it during my most recent visit, I have fond memories of the Sopa De Ajo (a soup of garlic and egg in chicken broth). It’s heavy on garlic and, to minimize post-prandial complaints (or excuses! ), should be ordered by one's date as well. 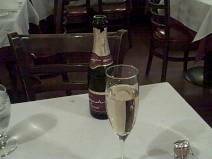 The effervescence of a Cava added the right sparkle to the sole and stood up to the garlic in the broccoli. Other menu items, such as Paella, salmon, various Pollos and Chuletas, all look enticing—and considerably more affordable than the $33.50 grey sole. 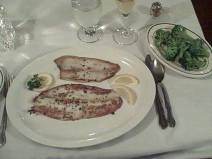 Perhaps some day I'll try something a little different—possibly the Broiled Filet of Grey Sole A La Parrilla?